A question that has come across my desk a lot recently is how to calculate training weights without ever maxing an athlete. Or coaches ask how to monitor progress if max days are never a part of the program. For coaches that have already read my thoughts on max days in the former posts Where Have all the Max Days Gone and Get It Up At All Cost Part II will know that I’m not a huge advocate of max out days. That’s not to say they can’t be useful, but I often find more value in not doing them. With that said there are a multitude of options available for developing athletes without finding or having a max training number. Some of the various options I have used over the years are listed below. Using the APRE may be one the best methods for those athletes who have no max. The biggest benefit in my eyes is not having to test athletes for a max to begin a training cycle. A ballpark number in the APRE works absolutely fine as the method constantly adapts to the current level of the athlete. This makes ideal with athletes that are returning after long layoffs and detrained. Since this article truly isn’t about the APRE, another benefit to using the APRE method is its ability to give a rough working max. The final working sets are done to failure or close to giving coaches a weight and reps to calculate a working max in the future. I use at times indicator sets to make adjustments throughout training blocks. An indicator set is nothing more than doing the last set of the exercise for as many reps as possible. I generally don’t like failure on the last set and will commonly stop athletes with a rep or two left in the tank. Indicator sets allow coaches to assess whether a working max is too heavy or too light. As an example, we may perform a 3 week block of work in the 70-80% range with an indicator set to finish the third week. This example assumes athletes have a working number to base percentages on. Following the indicator set, I can then adjust working maxes for the next training block based on how many reps each athlete achieved. 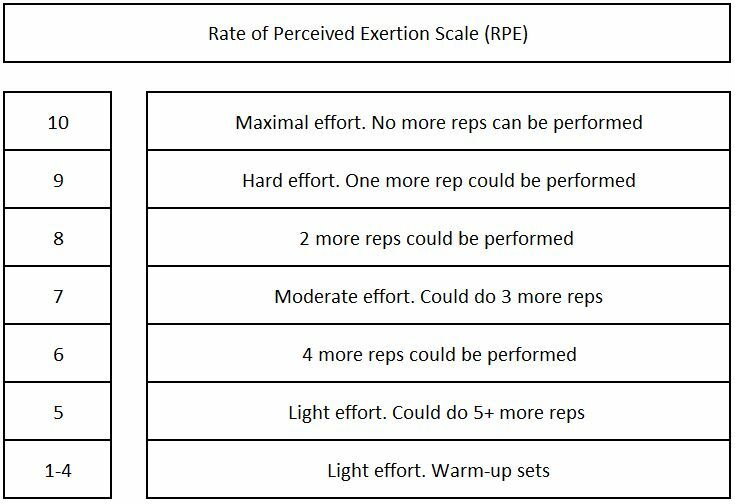 The use of the rate of perceived exertion scale, or RPE can be beneficial for coaches in this instance. RPE’s are a subjective measure for athletes to judge how hard they feel like they’re working during a particular set or exercise. The score ranges from 0 to 10 with 10 being a maximal effort. A level of 10 essentially means that effort was maximum at that weight. Athletes could not do any more reps whatsoever. An RPE scale can be useful when athletes have no training max to obtain training percentages. 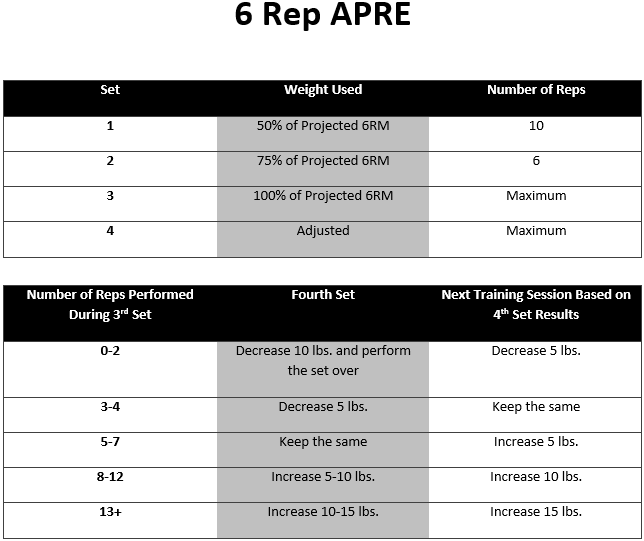 Establishing sets and reps to an RPE scale can accommodate to the readiness of the athlete for the day as well as determine working intensity along the same lines of percentage based programs. An athlete who is increasing strength at a fast rate can easily take advantage of using an RPE and increase loading faster than following standard percentages. Athletes on the other end of the spectrum who are having a bad day can adjust weights down to compensate. RPE’s can be assigned to workloads to assist in determining intensity. With information on perceived difficulty coaches can easily convert working sets into training maxes. One of the best ways I’ve found in setting numbers is simply by the letting athletes work up to heavy singles or doubles when they feel it. We don’t set a timetable or a max day. If an athlete feels great for the day and asks to work up in weight, I will generally allow it. I allow this by watching the lifts closely and making sure it fits in the overall plan of what we’re trying to accomplish at the time. Athletes are often cut off at the first sign of struggle but many would be surprised at some of the performances athletes have had on a random day when they feel it. Using velocity based training can be another method to find, and or test maximal strength levels. In my opinion VBT should really be left to the advanced athletes so I don’t often find a ton of use for testing purposes here but I do know coaches that use this method. Tracking velocity on a single day, or even over a period of time, can easily be transitioned into a working training max without ever nearing a max intensity effort. Using tendo units, GymAware or any other number of position transducers can detail barbell mean velocity over the distance of a lift. 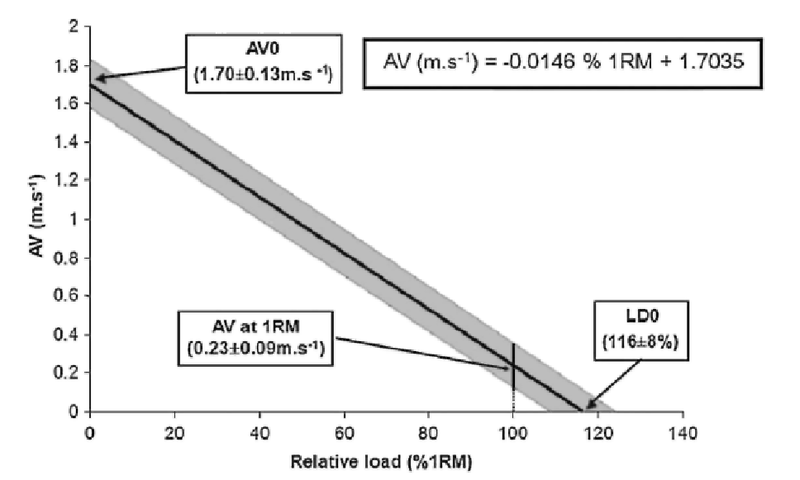 Mean velocity essentially decreases linearly with increasing load allowing coaches an easy system of finding maxes without ever touching heavy weights. A coaches eyes are one of the best tools in determining whether an athlete’s weight is too heavy or too light. Don’t neglect the value of simply watching your athletes. All of these methods can backfire when adjusting maxes. When an athlete does an indicator set or any type of rep max we must consider the fact that they may have simply had a great day. 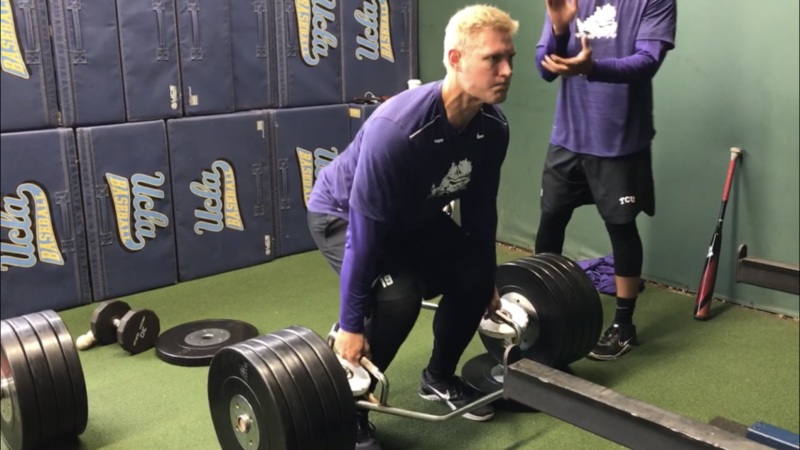 For instance, an athlete that was primed and ready to go may hit a homerun enticing the coach to move the weight up significantly for future training sessions. However, they may have been in a state of high readiness that day and the coach just over programmed their future weights. The next training session / cycle may involve a lot of struggle and failure to hit the predetermined weights. In my opinion, when adjusting weights, always err on the side of caution. 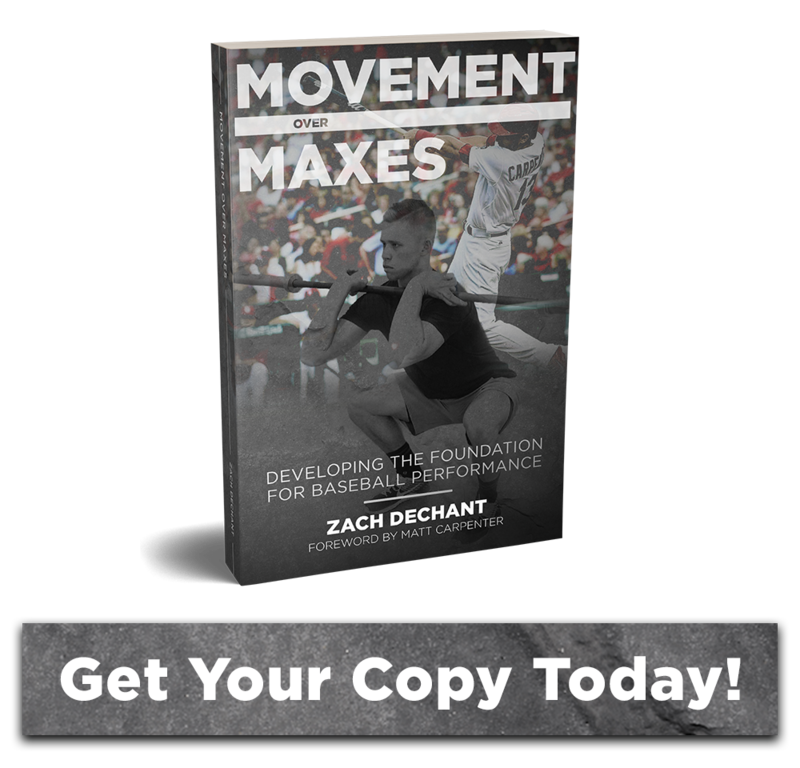 Let the athlete dictate, by their quality of lift, that they need increased training maxes. Leave them wanting more instead of being stapled every week by too heavy of a barbell.